Firstly more than one field had the same name, leading to a certain amount of confusion. Secondly, sometimes fields had more than one name. Thirdly, the surveyor would appear to have not always been sure which fields surrounded the one in which he was standing, even though he could be certain what that was called. For example, when walking along the line of fields IJKL the surveyor knew he was standing in field J and that I was to the north and K to the south, but G and F could be mistaken, and sometimes B and F were confused. Nevertheless, the location of most of the fields can be plotted when compared with the later cartographic survey of 1768. It was clear from the survey that the feudal system was almost extinct, and that the land was for the most part enclosed, if not totally hedged, and that the vast majority of the land was held either freehold or copyhold by quite a large number of individuals. ( This in contrast to the 18th & 19th centuries when the vast majority of the land within the manor of Gorhambury was owned by the Grimston family, and let to tenant farmers.) Several large open or common fields still existed, with individual strips belonging to different people. - Laydene, Shrewfield and common Woodreddings, were mentioned as being common fields, also Blackreddings which was between Westwick Row and the Berkhamsted Way. The size of these various holdings varied considerably from less than 5 acres, to 546 acres. It is also worth noting that one person's holdings weren't necessarily all together in one conveniently neat unit, but that different parcels of land could be held by one individual in a variety of locations, rather like players in a game of Monopoly holding the title deeds to properties at different locations around the board, with sometime more than one player owning the properties blocked together under one colour. It would be possible to list all the various parcels of land, their various owners and the relative positions of them, where they come within our study area. To do this in entirety is, I feel unnecessary. I have, however, covered much of the survey in detail as it is one of the earliest such detailed accounts of our area. 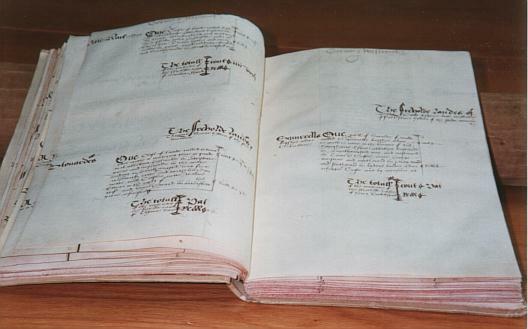 Should the reader wish to get a more overall picture they should refer to the original document at HALS. Despite it's great age the survey is very easy to read.
" The farme and landes in the tenure of Henry Knight being demeaned of the saide mannor of Gorham and Westwick/lying without the park. THE FERME HOUSE AND HOME FEILDE The ferme house with the yardes Garden Orchard and one Close adjoyning to the same house called Homefielde abutting Eastward uppon a Close of Richarde Lacebury called Stonelett and Westward uppon The Way called Westwick Rowe and Northwarde uppon a lane called Hogdgill Lane and Southward upon a Close called Longe Dennefeilde parcell of the saide farme. " On my map showing the late medieval infrastructure of the area, I have shown Hogdgill Lane as being yet another lane leading from Westwick Row, and not just another name for Hodges Lane, which ran next to Westwick Row farm, as assumed by Jonathan Hunn in his report. I have based this on several premises. If we assume that Hogdgill Wyck is the same parcel of land which later became known as Hodges Wick, the survey for Hogdgille Wycke (see below) suggests that Hogdgille Lane ran around three sides of it - if you look at the 1768 map, and indeed even the early edition O.S. maps, that implies that the field boundary shown running almost parallel to Hodges Lane and towards Gorhambury was infact a lane as shown on my infrastructure map. There are therefore two possible assumptions we can make, either Hodges Lane began at Westwick Row, travelled towards Gorhambury, around Hodges Wick field and back down to Westwick Row, effectively going around three sides of a rectangle, or the surveyor got it wrong when assuming that it was all the same lane. In any case I do not think it possible that he could have assumed Hodges Lane bounded the homefarm to the north, as it was too far distant. The exact location of the farm being established beyond doubt by the map of 1634. Other land let to Henry Knight included Long Denne feilde and Younges Wicke, Netherdene; Upper Denefelde Wellfeilde; Blackwater Croft, Hogdgille Wycke and a piece of ground in Shrewefeilde. Longe Denne feilde and Younges Wicke were two large fields, probably close to the home farm and abutting to East on the park pale, to the west on Westwick Rowe, to the north on Upper Holm Feilde and a field of Lacebies called Stonelete, and to the south upon Richard Smythes orchard and a close called Connydell. "...abuttinge Eastwarde uppon the highe way aforesaid called Westwicke Rowe and Westward uppon Berkhampstead High Way and northewarde uppon a Close of William Westes called fower acres Close and Southwarde uppon a close of Richarde Smythes called Bechefeilde." "...abuttying Eastward uppon the highwaye leadinge from St. Albans to Berkhamstead and Westwarde uppon a close of one John Deacons called Markeyate lande and northwards uppon a Close of the said Lacebies called the Harpe and southwarde uppon a Lane called Blackwater Lane." "Eastwarde uppon Hogdgill Lane aforesaide and Westward uppon the same Lane and northwarde uppon a close of Lacebies called Wheal pightell and southward upon Hodgill Lane aforesaid." "Stonynges..sett lying and beying at Hillend." either side of Hagdells Lane. "One Close of land lying at Westwicke Rowe... abutting Eastward on a felde called Grovefeld and Westward om a Waye leading from Saint Albons to Berkhamsted called Berkehamsted Way and Northward on a Lane called Twychell Lane and Southwarde uppon a close called Blackredding Crofte." " abutting eastwarde on Plichell Lane and Westwarde on Blackrudding Crofte and northwarde on Grovefeild and southward on the saide parcell of ground there, the said Benjamin Ibgrave..... One other crofte of land there called.....abuttinge eastward on Westwick Rowe and Westward on Twychell Lane and northward on the same Twychell lane and Southward on Plichell Crofte aforesaid.."
"The house Orchard and two little wicks abbuttinge Eastward on a close called Nynyngs and Westward on Westwick Rowe." "One pece of Lande lying in a felde called Blackrudding abutting Eastwarde on a crofte of Henry Dells holden by Copie called The Crofte behind the house and westwarde on Whites Land in the same feld called Blackrudding and northwarde uppon Westwick Rowe and Southwarde uppon the said Whites Lande called Blackrudding." "One crofte of land called Little Blackrudding abbuttinge Eastwarde on greate Blackrudding and Westward on a field called Grovefeild nowe William Ewers late Thomas Howes and Northwarde on great Blackruddings aforesaid and southward on Berkhampsted Way." " One close of lands called Stonardes with a watering place or ponde in it abutting Eastward on Laverstowe Grene and Westwarde on the waye leading to Berkhamsted Way from Westwicke Rowe and Northwarde on newe mille Croftes now William Ewers in the right of his wife and southwarde on Laverstow Green aforesaiyd." I think it likley that the above property was still standing as late as 1768 when a house is shown in the same position on the then Gorhambury Survey [HALS D/EV/P2 ]. By the Tithe survey of 1840 it had disappeared. Photograph of HALS doc XI2 by Barbara Chapman, published here with the kind permission of Hertfordshire Archives & Local Studies. "Peazefeilds belonging to the house of the said Richard Smith called Blackwater House holden of Markyate." If I read the various entries aright, Blackwater House was where we would expect it to be, to the south of Blackwater Lane. The fields surrounding it - Peacock's Nynings, Blackwater pightle, Putreding Spring and Peazefeilde are all part of the manor of Gorhambury and Westwick, and yet the house is said to be holden of Markyate - that is the manor of Market Oak etc.It is interesting to note from this survey, as well as other old documents, that women appeared to have more rights than was common by the 19th century. Land quite often appeared to pass down through the female line, and widows especially, frequently applied to the Courts Baron for rights of tenure. However, once they remarried, their new husbands appeared to gain the rights to the property. In this survey, it would appear that not only did some widows appear to have rights of tenure in some instances, but that one woman- Heleyn Clerke - had the freehold of a parcell of land called Blakes feild. This was next to other parcells of land with the same name and to the north of Blakes Lane. "One other close of lande nexte adjoining to the great brache aforesaide abutting Eastward uppon the same great brach and westward upon a close of land nowe............holden of Markyate and northward upponn the said blackwater grove and southwarde upon the said way leading to Watford." Other lands held by Feilde were: Pondfeilde alias Hyltons Laye, Bullshott, Great Brach, Little Brach. "A Messuage or Tenement in the tenure of Richard Smythe with the yardes orchards and backsides situate and being in Westwicke Rowe." "The close next the house, a parcell of mainpightell, The Nether Closes and Fower Acre Close.... "with a Springe (wood) in it abuttinge eastwardes in the landes demeasnes in the tenure of Henry Knight and Westward on the same demeanes and northwarde on Westwick Rowe and Southward on Berkhamstead Way." "One messuage or tenement with the orchards, yard, carthouse, garden and backside situate and being in Westwicke Rowe aforesaid." " One other close of lande called Beryfeild withe a way leading thense to the said tenement abutting east upon a field late Bunne and afterwards the said Smithes and nowe the Lordes by exchange with the same Smith." This was listed as being part of the land within the park of Gorhambury - which at this time extended much further towards Leverstock Green than in later centuries, and giving the name Newpark to some of the fields.
" eastwards uppon a Lane called Bunnes Lane and Westwarde uppon another lane leading from Woodend to St. Albans and northwards upon a close called middell Berry Feilde and Southwarde on a close of lande late Sares called Mynettes." Middle Bery Feild and Little Bery Feild, were also in the same area and belonging to Peacock.
" A mesuage or Tenement with the Orchardes, yard and Backsides sett and being in Westwick Rowe within itself." 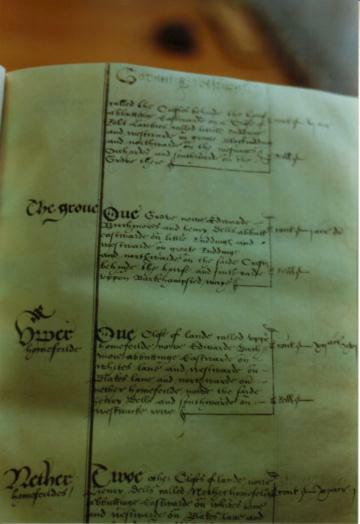 Photograph of part of HALS doc D/EV/P2 , 1768, by Barbara Chapman, published here with the kind permission of Hertfordshire Archives & Local Studies. The gold arrow highlights the property called Stoneards. He held Great Rudding, Dellcrofte, White crofte, Deane Feild, and Wheate Pightell. "One other close of lande called Leycrofte and Stonelete abutting eastwarde on the lordes demeanes in the tenure of Henrye Knight and Westward on Hogdgill Lane, and northwarde on the landes sometimes Springoldes and nowe parcell of the Lordes demeanes and southwarde on the same late landes of Springoldes now demeanes as aforesaid." "...abutting eastward on the landes of Richard Lacebye called Great Ruddings and Westwarde on Henry Dell's House and Land ( now known as Dell Cottage) called the Crofte behind the house and the grove there and northwarde on West Wicke Rowe and Southwarde on Berkhamstead Way." Lacebye was in addition the holder of the important triangle of land known as The Harpe. "One other close of lande called the harpe abbuttinge eastward on a crofte of the Lordes in the tenure of Henrye Knight called Blackwater Crofte and westward on Berkehampsted Way and southward on the ground of one Deacon holden of Markyate." Photographs of parts of HALS doc XI2 re The Landes of Richard Lacebye by Barbara Chapman, published here with the kind permission of Hertfordshire Archives & Local Studies. 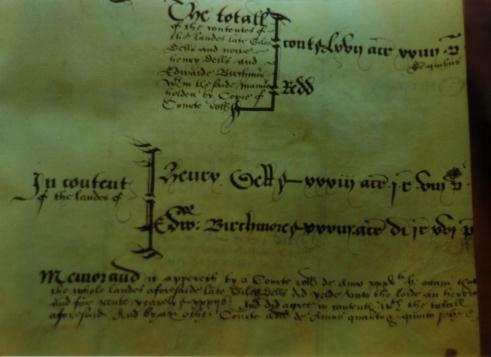 Robert Lacebye also held the following: Clerkes Crofte and Clareswick, Woodfeild, Mercrofte (or possibly Mecrofte) alias Allyscrofte, and Mercrofte. "Two messuages or tennements in Westwicke Rowe lying together with the orchard and yardes in the several tennures of Edwarde Birchmore and the said Henry Dell." Photograph of part of HALS doc XI2 re The Landes of Robert Lacebye called The Harpe by Barbara Chapman, published here with the kind permission of Hertfordshire Archives & Local Studies. The present day Dell Cottage is in the right possition and would appear to have been the tenement in question. I am unclear as to whether there were in fact two detached properties, or a semi-detached building. It is quite possible that one of these two messuages was what we now call Westwick Cottage. Of his father's land, Henry Dell now held: The Croftes Behind the House, Netherhomefeild, Stocking Crofte, and two parcels of land in Laydene. 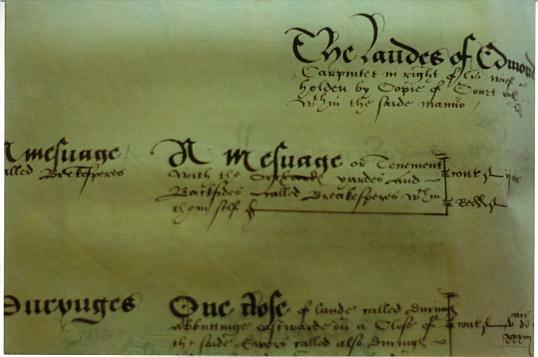 Edward Birchmore held the copy hold of the following, "in right of his wife": Upper Homefeild, Middlefeildes, Overfeilde and four parcels of land in Laydene. They also seemed to have a moety (that is a half share) of the Grove. The entries for Henry Dell and Edwarde Birchmore reveal yet another small lane - Stockingecrofte Lane, which was to the south of the parcell of land known as Stocking Crofte. 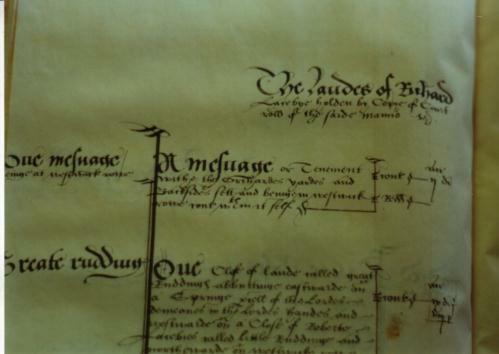 Photograph of part of HALS doc XI2 re The Two Messuages late in the tennure of Henry Dell & Edwarde Birchmore by Barbara Chapman, published here with the kind permission of Hertfordshire Archives & Local Studies. The copyholder of two small parcels of land next to Twichell Lane (Pancake Lane) was Raufe Longe. This land had previously belonged to Thomas Howes, who by 1569 was deceased, and had also at sometime been in the possession of Peter Griggs. These two fields were called Overfeilde and Homefield. Both were bounded on the east by Twichell Lane and to the West by New Mill Crofte. 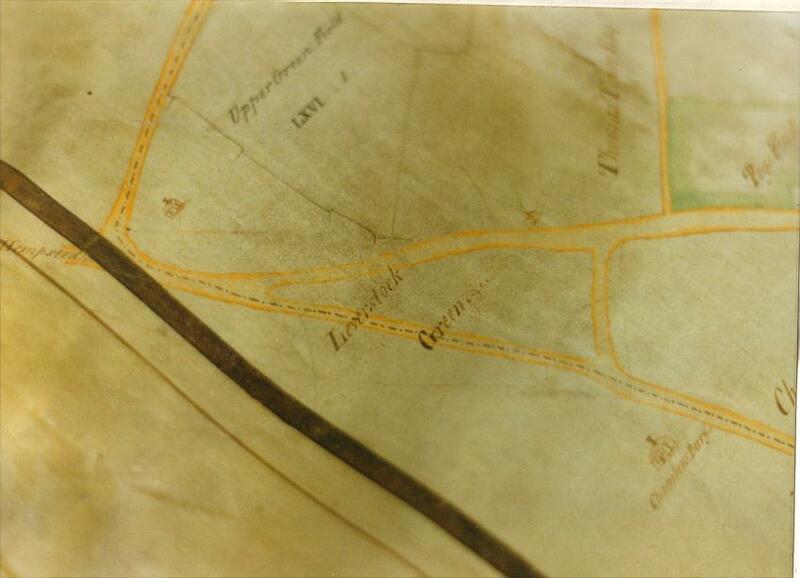 Overfeilde reached down as far as the village, it being abutted to the south by "Laverstowe Green". Homefield was immediately to the north of Overfeild. Photographs of part of HALS doc XI2 concerning the landes of Henry Dell & Richard Brichmore by Barbara Chapman, published here with the kind permission of Hertfordshire Archives & Local Studies. "A Messuage, late Howes. A messuage or tenement in Westwicke Rowe with the yardes, Orchardes and Backsides late the said William Howes, within itself." "One other close of lande called Grovefeild with a little spring in it abbutting eastward on a Close of one Ibgrave's called Little Rudding and a Commen feild called Blackrudding and Westward on Twichell Lane and Northward on Plychell Crofte and southwarde on West Crofte." 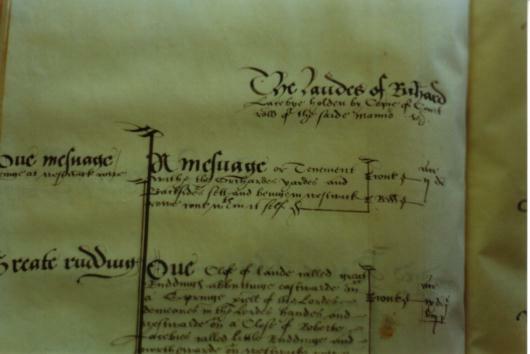 Photograph of part of HALS doc XI2 concerning the landes of Raufe Longe by Barbara Chapman, published here with the kind permission of Hertfordshire Archives & Local Studies. Other lands owned by Ewer included Blakes Crofte, Smythes Acre, Little Brodefeilde, Bridlecrofte and " a pece of lande in the commen feilde called Laydene.".
" A messuage with outhouses, yardes and Backsides late Sares and now the said William Ewers in right of his wief without fees"
"One other tenement or cotage with yardes orcharde and close therunto adjoininge called Netherhouse Close abbutting eastwards on Comon Woodfeild late Whites and abbutting westwards on Westwick Rowe and northwards on Blakes Feilde and Southwards uppon Westwick Rowe aforesaid." 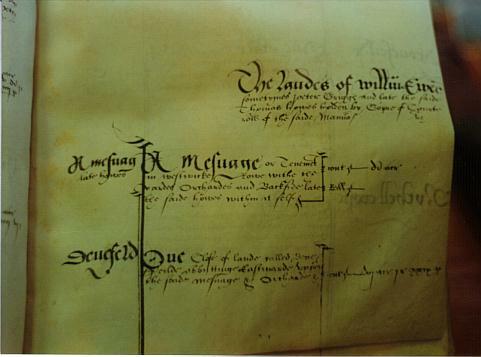 Other land obtained from his wife on their marriage included New Mill Croftes, which were three fields running down Green Lane towards Stonards, and covering much of the land occupied by Leverstock Green School today; Mynettes, which bordered the very top end of Green Lane and which today would have been part of the Buncefield Depot, (see Map of Medieval Fieldnames); Nokefeilde, Ivrings (or possibly Lurings, it was difficult to decipher), Littell Blakefeilde, Hasell Dell and a pece of Laydene. All these fields were in the region of Breakspears and Megdells. Breakspears itself was owned by Edmond Carpenter, who like William Ewer had obtained it through marriage. Along with the house of Breakspears were several fields in its vicinity: Durynges, Pondcrofte, Northfield and Peazcroftes, Furrows, Brodfeilde, Blakesfeilds, Long Furlonge, Snotbeche,and Marlecrofte. He also had three parcels of land in Laydene. The exact size of the holding was obviously in doubt as a memo stated that an inquiry had to be made into it. 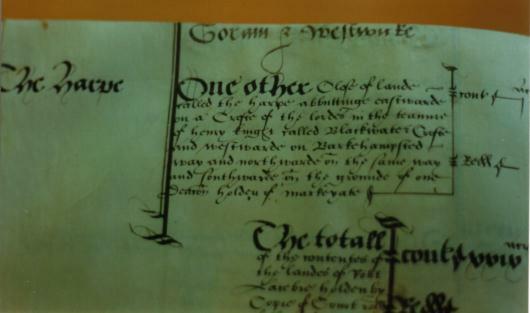 Photograph of part of HALS doc XI2 concerning the landes of William Ewer by Barbara Chapman, published here with the kind permission of Hertfordshire Archives & Local Studies.
" a messuage or tenement with the orcharde and yards and a springe of wood thereunto next adjoining." The following fields formed part of the holding: Nether Bunnsfeld, Middle Bunsfelde, Over Bunssfelde, Six Acre Crofte, the Close Beneath the House, Pondfeldes, Great Smythesfelde and Further Smythes Feilde. The fields for the most part were adjacent to one another and stretched over as far as Hangmans Croft (or Hanging Croft as it was referred then.) Hogg End Lane was referred to as Portdell Lane. The copyhold lands of Thomas Hedge included Wardes (Kettlewells). 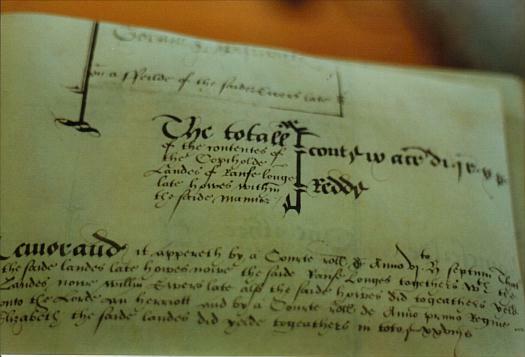 Photograph of part of HALS doc XI2 concerning the landes of Edward Carpenter by Barbara Chapman, published here with the kind permission of Hertfordshire Archives & Local Studies.